Recombinant fragment corresponding to amino acids 1160-1493 of Human Ki67 produced in E.coli (NP_002408). Human breast adenocarcinoma, colon, colon adenocarcinoma, lung carcinoma, endometrium adenocarcinoma, bladder carcinoma, lymphoma and tonsil tissues. The clone number has been updated from 5D7 to OTI5D7, both clone numbers name the same clone. ab156956 was purified from cell culture supernatant by affinity chromatography. Our Abpromise guarantee covers the use of ab156956 in the following tested applications. ab18407 - Rat monoclonal IgG1, is suitable for use as an isotype control with this antibody. Immunohistochemical analysis of paraffin-embedded Human breast adenocarcinoma tissue labeling Ki67 with ab156956 at 1/150 dilution. Heat-induced epitope retrieval by 10mM citric buffer, pH6.0, 120C for 3min. Immunohistochemical analysis of paraffin-embedded Human colon tissue labeling Ki67 with ab156956 at 1/150 dilution. Heat-induced epitope retrieval by 10mM citric buffer, pH6.0, 120C for 3min. Overlay histogram showing Ramos cells stained with ab156956 (red line). The cells were fixed with 80% methanol (5 min) and then permeabilized with 0.1% PBS-Tween for 20 min. The cells were then incubated in 1x PBS / 10% normal goat serum / 0.3M glycine to block non-specific protein-protein interactions followed by the antibody (ab156956, 1/10000 dilution) for 30 min at 22°C. The secondary antibody used was Alexa Fluor® 488 goat anti-rabbit IgG (H&L) (ab150077) at 1/2000 dilution for 30 min at 22°C. Isotype control antibody (black line) was rabbit IgG (monoclonal) (0.1μg/1x106 cells) used under the same conditions. Unlabelled sample (blue line) was also used as a control. Acquisition of >5,000 events were collected using a 20mW Argon ion laser (488nm) and 525/30 bandpass filter. This antibody gave a positive signal in Ramos cells fixed with 4% paraformaldehyde (10 min)/permeabilized with 0.1% PBS-Tween for 20 min used under the same conditions. Immunohistochemical analysis of paraffin-embedded Human colon adenocarcinoma tissue labeling Ki67 with ab156956 at 1/150 dilution. Heat-induced epitope retrieval by 10mM citric buffer, pH6.0, 120C for 3min. Immunohistochemical analysis of paraffin-embedded Human lung carcinoma tissue labeling Ki67 with ab156956 at 1/150 dilution. Heat-induced epitope retrieval by 10mM citric buffer, pH6.0, 120C for 3min. Immunohistochemical analysis of paraffin-embedded Human endometrium adenocarcinoma tissue labeling Ki67 with ab156956 at 1/150 dilution. Heat-induced epitope retrieval by 10mM citric buffer, pH6.0, 120C for 3min. Immunohistochemical analysis of paraffin-embedded Human bladder carcinoma tissue labeling Ki67 with ab156956 at 1/150 dilution. Heat-induced epitope retrieval by 10mM citric buffer, pH6.0, 120C for 3min. Immunohistochemical analysis of paraffin-embedded Human lymphoma tissue labeling Ki67 with ab156956 at 1/150 dilution. Heat-induced epitope retrieval by 10mM citric buffer, pH6.0, 120C for 3min. 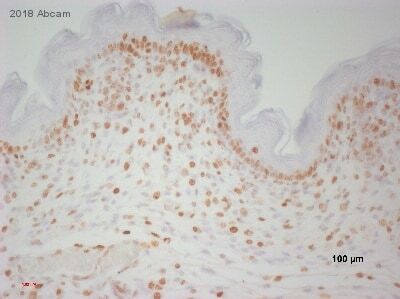 Immunohistochemical analysis of paraffin-embedded Human tonsil tissue labeling Ki67 with ab156956 at 1/150 dilution. Heat-induced epitope retrieval by 10mM citric buffer, pH6.0, 120C for 3min. Publishing research using ab156956? Please let us know so that we can cite the reference in this datasheet.